Our group is working on the generation of new functional biomaterials including metal, ceramic, polymer, and hybrid material via precision processing, thereafter, functionalization of the biomaterials by nano/micro physical/chemical patterning on the surface, finally development innovative biomedical devices, such as orthepedic biodegradable metal implant, biodegradable cardivascular/urology metal stent, functional intraocular lens/contact lens, and so on. IBPL is also studying tissue engineering on the cell-materials interface and biomicrosystem/ bioreactor/ perfusion system for tissue regeneration. Science and Technology Advisory Committee. 2017. 03.02 Congratulations!! Dr. Hojeong Jeon was promoted to Principal Research Scientist. 2016. 07. 07 Congratulations!! Dr. Kim was awarded " 2016 National R&D Excellence Award "
2016. 02.05 Congratulations!! Our team was awarded " Best Research Team of the year "
Congratulations!! Our team was awarded " Best Safety Security Team of the year "
" National research council of Science and Technology (NST) Chairman's Award "
Our team was awarded the Best Research Team of the year and Best Safety Security Team of the year during the 50th Anniversary Ceremony of KIST. Additionally, Mr. Jimin Park was awarded the NST (National research council of Science & Technology) Chairman's Award during the ceremony. 2015. 09.21 Congratulations!! Dr. Jeon was awarded " Best Researcher of the month "
Dr. Jeon awarded " Best Researcher of the month (이달의 키스트인상) " for his outstanding achievement, cell-controlling nanopatterns, which was published in Nature Materials last month. Mr. Jimin Park and Dr. Ok's paper was accepted for Angewandte. Chem. Int. Ed. Mr. Jimin Park's paper was accepted for Nature Communications. 2015. 07. 23 CBM-IBPL, Group photo in front of the International Cooperation Bldg. excellent opportunities for cooperating each other and releasing the stress. Dr. Indong Jeon (Advisor: Dr. Hojeong Jeon) awarded "Excellent Paper Awards"
" Excellent Student Poster Awards "
See the full video at below address. 2014. 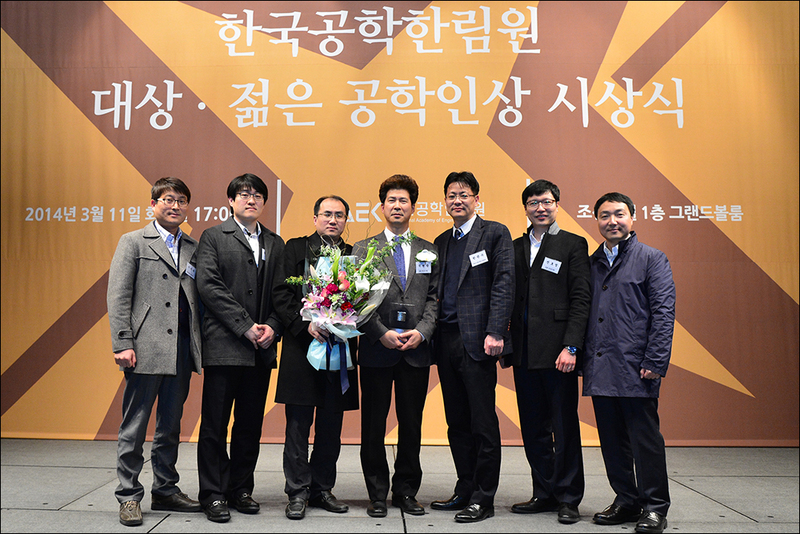 11.01 Our team's Research covered by BBC world new entitled " Disappearing screw "
Chung-A Kwon (advisor : Dr. Hojeong Jeon) awarded " Excellent Student Paper Awards "
2014.03.02 New Team Member, Jimin Park, join us!!! Congratulations. 2014.01.02 New Team Member, Dr. Myoung-Ryul Ok, join us!!! Congratulations. 2014.12.02 Biodegradable Metals covered by Korean broadcast channel MBC. Hyelim-Lee (advisor : Dr. Hojeong Jeon) awarded " Excellent Student Poster Awards "
awarded " Excellent Student Poster Awards "
2013.08.06 New Team Member, Hyung-Seop Han, join us!!! Congratulations.